My second year in the Interior Design and Architecture program at University of Idaho was all about abstraction. The studio based its curriculum on discarding the notion that a building is a just a box. A building can be much more than just a box. Humans need to inhabit spaces that are much more than boxes to lead a healthy life since we spend about 93% of our time indoors (Environmental Protection Agency). The Elements of Art are line, shape, form, value, space, color and texture. All of these can be used to make a space for humans to inhabit. Architecture isn’t only about simply making a space for humans to function properly in, though. It’s also about giving the user an experience to stimulate interest. Otherwise we would just live in boxes. The free flowing, geometric form of the coffered timber roof and vertical arrangement gives visual interest while at the same time mediates natural daylight and assists natural ventilation. The texture of the wood that is scattered throughout the building gives a clean, natural and fresh feel to the space. Lastly, the open space in the center of the building allows for flexibility and balance to the rest of the turns and corners surrounding the rest of the structure. The form of this building is exactly what my second-year studio told me not to do: make a perfect boxed structure. The interpreted line that the small windows dotting the building make, make it feel like a prison from the outside: boring to look at. The color of the building is very bland and is the same throughout the exterior. Learning Curve is an ongoing series from the perspective of our interning students who are currently in school to become the world’s next generation of designers. This edition is by Jessie Macomber who is in her final year in a double major of Architecture and Interior Design at the University of Idaho and will be headed on to the Master of Architecture program next year. Her continuously curious mind and love of art drew her to the design profession, and she can often be found studying and sketching everything around her. “I looked at Architecture and Design as something that took art and turned it into something practical – something that made an impact on how people lived their lives,” Jessie says of her decision to choose a path in design. Rounding out her love for the built world and art is the importance that she places on friends and family in her life and the impact that has on how she views the ways in which design can enrich lives and ultimately help bring people together. Summer 2018 promises to be fun and colorful. We’ve pulled together our top 5 favorite trends for summer decorating from the Pinterest 2018 top 100 predictions. Some of these are fresh and new while others have been around for a while but are gaining new popularity. 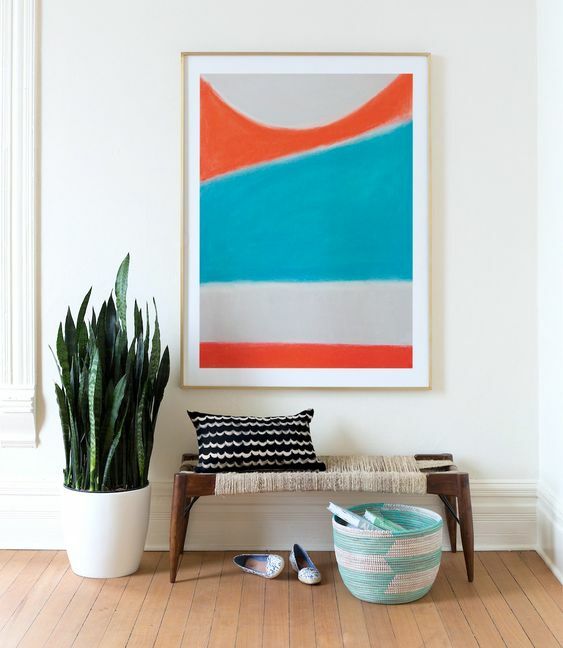 Whether you are looking for ways to bring a little pizzazz into your life or just enjoy some eye candy, check out our favorite selections for your summer design inspiration. Add unexpected character to your space with a pop of (ceiling) color. The ceiling accent was around long before the accent wall and is picking up again since the accent wall trend tapered off. What we love about it: expand your space to include design on every surface; the ceiling is an often-forgotten opportunity for expression. Greenery isn’t just about the lone ficus in the corner anymore, but incorporating plants as an integral part of the décor. Hanging & potted plants mingle with the rest of a design scheme to provide color, texture and pattern. What we love about it: Our leafy green friends are not only beautiful, but they also clean our air and give us those biophilia feel-good vibes. Make a bold first impression with a colorful door to fit your personality. Front doors are a long-standing favorite accent opportunity and are now more fun than ever. What we love about it: doors are the perfect opportunity to add a pop of color and curb-appeal to your home, plus it’s a small area to cover so you can always switch it out later without repainting your entire home. Vertical surfaces are getting an update with bold wall graphics and artwork. What we love about it: you can create a visually engaging and lively atmosphere with a single bold move. Shown here is Mr. Blow from Abnormals Anonymous and Surf’s Up by local Seattle artist Melanie Biehle. Ok, so this is not a design trend, but they are perfect to enjoy while choosing your new graphic plant or bold front door color. Smoothie bowels are a great healthy solution to that summer sweet tooth when you are craving a cold dessert. Check out this beautiful (and delicious) recipe from PopSugar. There are various ways to approach a new design. From hand sketches, to model building, collages, photography, 3D modeling, etc. Architects learn to become inspired and use various medias to convey their ideas. One growing example of an approach is parametric modeling. With computer technology gaining speed, parametric design features parameters within a program, such as Grasshopper, to clarify and encode relationships between elements. 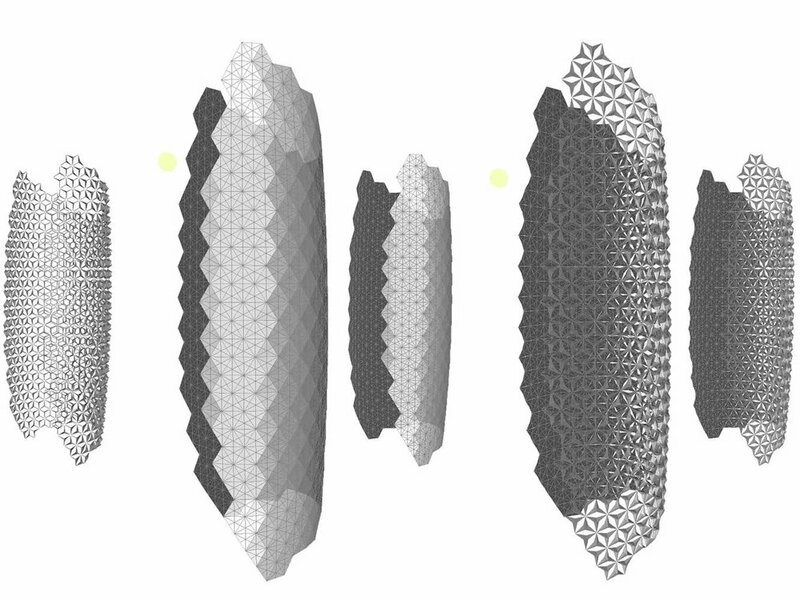 Designing with many iterative shapes makes parametric modeling a useful tool. It allows for quick manipulation to a specific design. Factors that may call for change and response include zoning heights and setbacks, natural daylight, shading, structural frame, floor areas, etc. All this can be instantly manipulated with a change of a number in the code script. With many factors having an impact on several iterations until coming up with the product of a final design, parametric modelling uses time efficiently to make these changes to the interior, exterior, and detailing. Therefore, designers can go through more options with a client in an efficient time period. As a student, what fascinates me the most with parametric modelling is the form you’re able to achieve. While most modern architecture is represented with flat planes or rectangular forms, parametric modelling can create curved, manipulated, and twisting shapes appealing to speculate by the eye. A studied example in which parametric modelling was utilized are the Al Bahar Towers in Abu Dhabi. Aedas Architects were able to utilize parametric script to design the towers’ responsive façade screens. 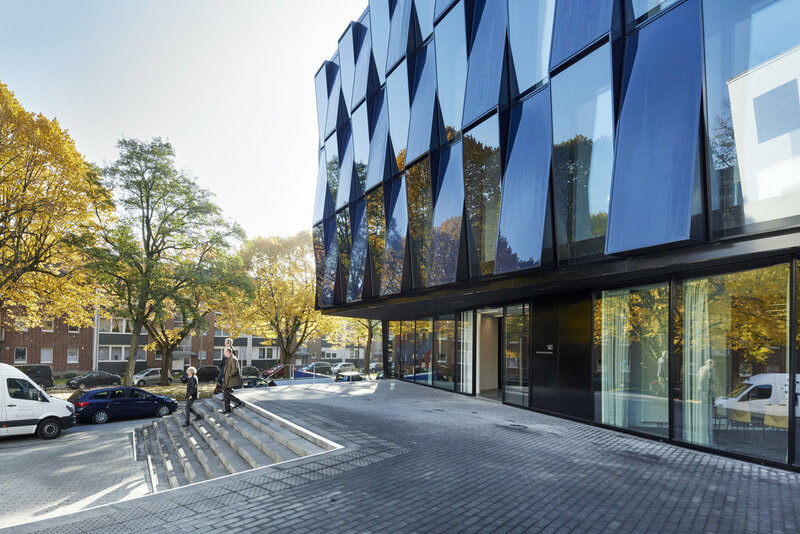 With the location’s direct sunlight, a sustainable approach was taken to create kinetic screens to self-move and respond to the sun exposure at various times/days of the year. In return, this provides more shade to cool the interior and eliminate unnecessary HVAC use. The individual iterative shape of the screens themselves were derived from the “mashrabiya” which is a local traditional Islamic lattice. Here, parametric modelling became a solution to combine culture with sustainability and design. You know when you travel to a place and everyone always craves the “local” experience? Well if you want that, my first suggestion for you would be to visit Morocco. It’s hard not to see and experience the day to day life of locals in the old medinas of Morocco. The old medinas are the ultimate transformation of space. Before 10am and after 8pm the storefronts are closed and streets are for the most part empty (other than your local gang of cats). During the day the streets lined with doors become lines of shops spilling out onto the streets. Now you’re dodging either the donkey and cart or the man speaking French to you trying to sell you Aragon oil or black soap. The old medinas are where Moroccans spend their days buying, selling, eating, socializing, and of course drinking mint tea. Opposing the streets are lush interiors containing courtyards filled with plants, intricacies of plaster hand carvings, and tile work. You’d find this type of detail not only in Mosques and palaces, but in buildings like the airport and train station. The Yves Saint Laurent museum in Marrakech, designed by Studio kO, was one of the few “modern” buildings we saw in Morocco. Its appearance was out of simple masonry that transformed into a lightweight, delicate material exploring new patterns and defying gravity with an upward sloping curve. The last stop was to Dubai for a wedding. Most of our time was spent visiting and celebrating with college friends, and not a lot of time for sightseeing. And yes, we were awe struck by the mammoth that was the Burj Khalifa, but it was the Louvre Museum in Abu Dhabi that I will dream about for years to come. Abu Dhabi is a city that is built on multiple islands and connected with bridges, so a building nestled in the water along with the mangroves only seems natural right? The museum is contained within a series of buildings all being protected by the layers of structure creating the massive dome above. All of the supporting structure of the dome is hidden from the perspective of viewers making it appear to be floating regardless of where you were in the museum. We learned from a friend of Sultan’s, who worked at the Louvre, that the structure is meant to resemble stars and in the morning the light would beam through the dome creating changing patterns on the ground, buildings and water surface. The overall experience was dreamlike. Inspiration Abroad is an ongoing series from the travels and explorations of the team at ATELIER DROME team and the things that inspire, delight and invigorate. This inspirational edition is by designer Cassie Lang, a Washington native who loves getting outdoors, exploring the world and it was through the search for balance between art and math that she found herself falling in love with architecture where the two blended perfectly. Read more about Cassie in her bio. Throughout the past few years in architecture school, a major topic of design that professors proposed is how can we design sustainably? Since buildings account for 46% of total carbon dioxide emissions, and 75% of total electrical use, we as architects are responsible for creative integrative system design solutions to ensure a more positive environmental impact. One approach can be the use of energy production components as both an energy system and a visual characteristic for a building. A unique example includes the New Blauhaus’ that was recently completed in 2015. 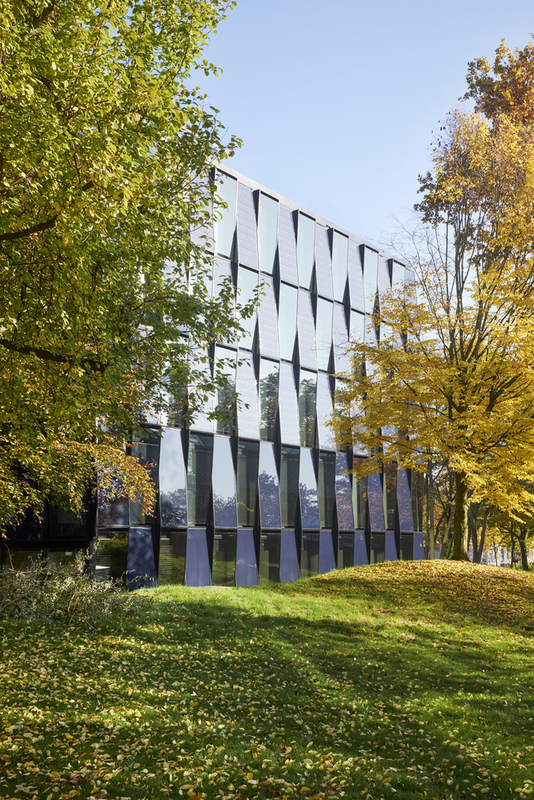 In its translation from German, the “New Blue House” provides a more contemporary version of bringing the public, education, and science sector together with the energy industry. The project is situated on the campus of Hochschule Niederrhein, University of Applied Sciences in Krefeld, Germany. It grew to be a collaboration between the school and NEW- an energy and water utility company to showcase the groundbreaking developments in the energy sector. 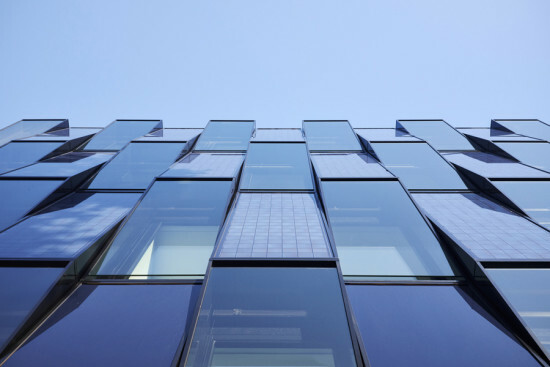 The displayed low-resource energy system of photovoltaic panels not only brings out the sculptural quality of oppositely inclined surfaces varying between these PV panels and blue-tinged glass panel, but also performs as a low-resource energy system. The panels are arranged to perfectly cooperate with the orientation and frequency of solar radiation hitting the site and cover the full energy demand to power the building to make it carbon neutral. Stepping aside at a distance, these panels become integrated with the architecture to give form to the New Blue House as a sculptural gem. This edition is by Anastasia Spassennikova who is in her first year of the Master of Architecture program at the University of Washington. With a love for both math and art, architecture felt like the obvious path that would meld the two into one exciting career. Her passion for the profession grew when she realized it was a gateway to learning about people and locations in various contexts. Designing a building for a specific client allows the designer to learn more about that individual's background and interests which makes every project unique. With the rare extra time outside of her studies, Anastasia enjoys exploring the world around her through drawing, painting and actively travelling to see things first hand.